With countless overdimensional shipments moving throughout the United States on a daily basis, most everyone has seen transported on our nation’s highways. But what about oversized loads and overweight loads that need to travel to domestic locations outside the contiguous 48 states? When roads and rails don’t span the gap between origin and destination, ocean-going barges and transport ships are the solution for these hard to reach domestic locations. 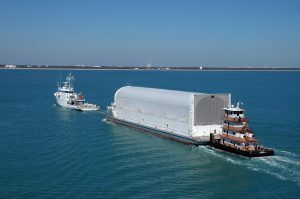 Be it an automobile, intermodal containers containing flat screen televisions or sections of premanufactured homes, ocean transport is one way to deliver valuable, heavy or overdimensional commodities to destinations impo ssible to reach by truck or rail. Such oceangoing ships are able to be loaded with and store all types of commodities, both above and below deck, in order to safely transport them to these remote locations. Hawaii, Puerto Rico and Guam are perfect examples where ocean transport solves logistical problems. However, it should be known that all ocean moves are not the same. Water transport to US-based locations and to true international destinations such as the Philippines, Chile or Japan – although carried out using similarly-equipped ocean-going ships – are completely different, and neither domestic brokers nor domestic carriers are able to legally transport freight to international locations. As such, be wary of any domestic carrier willing to quote or handle international freight. Non-vessel operating common carriers, (NVOCC’s), however, are companies that are able to rate and transport freight of any kind on an international basis. While NVOCC’s do not own any ocean-going vessels, they function as a true carrier by assuming responsibility for the shipments they move and for which they issue bills of lading. This means that an NVOCC can be a US-based company that can handle international transport in a completely legal manner. Don’t let the lack of road or rail prevent you from shipping your goods to domestic locations outside the lower 48. Let Reliance Partners be your resource for domestic oversized and overweight loads by providing us with the information requested in our “Get a Quote” box or by calling 877.668.1704 today.